Lovecraft Quest is a original сomics style game from OGUREC APPS. You have to avoid traps, solve puzzles and react very fast fleeing from Lovecraftian horrors which fill the labyrinth of the Temple of Nameless Cults. You’ll meet the lord of the Deep Ones – Dagon, the servant of the Ancients – Shoggoth and, perhaps, Cthulhu himself. The plot twists, life and common sense of the main character depend completely on your decisions. After a shipwreck you find yourself on an island, lost in the endless ocean. The only passage from the bay where you came to your senses, looks extremely ancient and full of hidden threat. This is an entrance to the dungeons of the Temple of Nameless Cults. What terrible secrets and beasts are hidden in the labyrinths of this Temple and where careless curiosity can lead you to find it all in a captivating comics story. There are a lot of interactive elements in the game – puzzles, alternative endings and inbuilt mini-games. 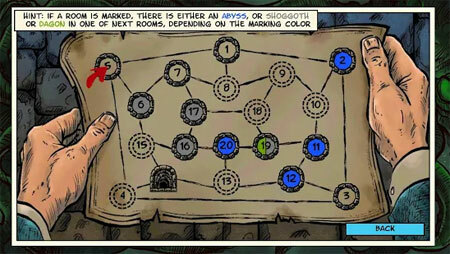 Minimalistic interface, also in comics style, lets you dive into mysterious atmosphere of ancient dungeons and fully enjoy the story told in the game. The game includes five different ending variants. In best Lovecraft’s traditions almost all of them are this or that variant of the main character’s death. If you get stuck in the game, check out the video walkthrough and gameplay for the game. This entry was posted in Android Games, iOS Games, Mobile Games, Walkthrough and tagged Lovecraft Quest Cheats, Lovecraft Quest Ending, Lovecraft Quest Game, Lovecraft Quest Gameplay, Lovecraft Quest Guide, Lovecraft Quest Hints, Lovecraft Quest Review, Lovecraft Quest Solutions, Lovecraft Quest Strategy, Lovecraft Quest Tips, Lovecraft Quest Walkthrough by Marvin. Bookmark the permalink.